Now our struggle is for genuine equality, which means economic equality. For we know now that it isn’t enough to integrate lunch counters. What does it profit a man to be able to eat at an integrated lunch counter if he doesn’t have enough money to buy a hamburger? The sanitation workers were striking in protest against unsafe work conditions and unequal pay. At the time of their marches, King had envisioned a campaign – the Poor People’s Campaign – to lift up economic justice in the civil rights movement. He saw that equality and equity – access to jobs and fair wages, a safe work environment, healthcare, education – were inextricably linked to achieving freedom, and aligned with the sanitation workers’ struggle for basic human rights. This, one of his last actions for justice, is our call to finish his work. The Poor People’s Campaign: A National Call for Moral Revival, is a 40-day, inclusive, cross-movement campaign reigniting King’s work to challenge racism, poverty, ecological devastation, and the war economy. Reverend William Barber is the driving force behind the campaign and calls on each of us to join the movement and finish what King started. Every Monday through June 23, organizers are hosting a Day of Action in state capitals across the country where you can voice your demands for a fairer and more just society for all. To find an event near you and join the movement, visit the Poor People’s Campaign website. For GLAD, reigniting the work means remaining committed to racial and economic justice in tandem with our fight for LGBTQ equality. As we dismantle discriminatory laws and pass groundbreaking inclusive and affirming policies, we recognize that our work does not and cannot end there. We must also challenge deep racial and economic disparities among our communities so that equality and equity extend to everyone. We’ve made incredible progress toward equality for LGBTQ people and people living with HIV, from winning the freedom to marry to ensuring people living with HIV are protected from discrimination under the Americans with Disabilities Act to updating family laws that reflect the beautiful diversity of today’s families. Yet even in a state like Massachusetts, where GLAD is headquartered and where we have made huge gains toward equality, not everyone in our communities is being lifted up equally by our victories. A recent report by the Fenway Institute and Boston Indicators provides a snapshot of the health of the Massachusetts LGBTQ community, and reveals some of the racial and economic disparities our ongoing work must confront. For example, a disproportionate number of LGBTQ people across the state live in poverty, with transgender people experiencing even higher rates of poverty. Additionally, a disproportionate number of LGBTQ youth who are homeless are youth of color. Stigma and bias, and non-affirming or unwelcoming family environments are some contributing factors for increased rates of poverty and homelessness among the LGBTQ community and communities of color. We know from other research that these trends are playing out across the country. 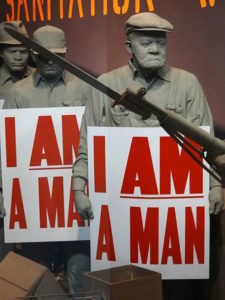 An exhibition at the National Civil Rights Museum in Memphis portrays the sanitation workers’ strike in 1968. This report isn’t just about numbers and percentages. It’s about real people who are bravely speaking out, being visible, and demanding to be counted. Theirs are the human faces behind the issues, and like the Memphis sanitation workers, who wore signs as they marched that said, “I Am A Man,” they remind us why we’re fighting for justice. Their experiences tell us that we have so much more to accomplish to ensure everyone in our communities, especially our most vulnerable – communities of color, LGBTQ elders, people living with HIV, transgender youth who are homeless or out of home – has equal access to the basic human rights we all need and deserve: jobs, fair wages, healthcare, education, and a place to call home. If we are to be successful in our fight for equality and equity, the LGBTQ movement must confront the range of experiences and disparities within our own communities. Our movement is stronger when we embrace the intersections and the commonality in our social justice struggles, and the power in our diversity. At the end of the day, it’s our shared humanity that grounds us as one justice movement. To learn more about the Poor People’s Campaign, and to find an event near you, visit www.poorpeoplescampaign.org.